The Kowaliga Restaurant at Lake Martin (named in honor of the Hank Williams song ‘Kowliga’) is open again, this time under the direction of two SpringHouse alums. A new theme park will be built in south Alabama, backed by a group of comedians, and already the name is…eeeehhhhhhh. Sigh. Lessons in How to Play with Fire in the NYT, on Jack Sanders, a Rural Studio alum, and his Austin company, Design Build Adventure. Mr. Sanders’s company, Design Build Adventure, makes elegant steel kitchens and furniture, rugged landscape elements, hipster hotels (like El Cosmico, a yurt, tepee and trailer complex in Marfa), conventional houses (like the “sandlot” renovation of a cottage for John Spong, a Texas Monthly editor), treehouses (the filmmaker Richard Linklater has one), high-style chicken coops and public art, among other things. The Market Diner Restaurant in Thomasville, Georgia is *amazing* and I can’t believe I’m saying/writing that because it’s a buffet, but still! Fresh, fresh, fresh, they must’ve had more than half a dozen peas and beans, there were casseroles galore and of course my favorite, rutabagas, and ohmystars the fried chicken was crazy-good. It’s one of those places where they give you a discount if you bring in your church bulletin on Sunday (I guess they would have accepted the Saturday announcement sheet from our synagogue, right?) and the walls have all kinds of taxidermy, rifles, and paper hornet nests. So perfect. Can’t wait to go back the next time we are in that part of the state. From NPR’s All Things Considered: Meeting Florida’s Seminoles Through Rediscovered Photos. Emily Matchar writes in her upcoming book, ‘Homeward Bound‘ about the romantic vision many have of domestic affairs pre-modernization; it’s excerpted at Salon and the article bears an unfortunate title. These narratives appeal to our collective sense of nostalgia: pink-cheeked farmwomen kneading homemade bread, mothers and daughters shelling sun-warmed peas on country porches, and multigenerational families gathered happily around the dinner table to tuck into Grandma’s hand-plucked roasted chicken. As the oft-quoted Michael Pollan saying goes, “Don’t eat anything your great-great-grandmother wouldn’t recognize as food” (in my case, that would mean a steady diet of pierogies and cabbage). Cordova, Alabama is demolishing downtown, which was partly destroyed by tornado, then later fire…I understand that some people are getting together to try to save the tilework at the old Tallulah Hotel, which I photographed above a few years ago. The ‘top 10’ tornado cities, via the Weather Channel, may not be the ones we think of first. Four of the top five are in Alabama and Mississippi. Funds are being sought to build a Tammy Wynette museum in Tremont, Mississippi. Mazel tov to Nathalie Dupree and Cynthia Graubar for their “Mastering the Art of Southern Cooking” winning a James Beard award. …and the other, the white Steinway, was unveiled this week and will be on display at the Old US Mint. Your Brothers in Greenville — took this pic back in 2005. Heavenly hot tamales. Dr. Manuel Ramirez, a professor of Mexican-American history, History of the U.S.-Mexico Border and Chicano Studies at UTEP, remembers trying to convince El Pasoans that tamales are prevalent in the African American South after returning from his Ph.D. studies at the University of Mississippi. “I would tell people back here that there were tamales stands in the Delta, and they would not believe me. So I sent them pictures from the Internet. Then they thought it was actually Mexican people who had these stands and restaurants but it was African-Americans,” says Ramirez. So how *does* nutria taste, really? From Boing-Boing. And armadillos have migrated to Tennessee. Faulkner’s ‘As I Lay Dying‘ to debut at Cannes this month; update with exclusive image at Entertainment Weekly. We like Trader Joe’s Speculoos Cookie Butter, but found out last week after I experimented in exchanging it 1:1 for peanut butter in peanut butter pie, that the original pb is actually better. It was still good, but not better. So if you have a jar use it for something else, because across the country it’s supposedly out of stock. Maybe the largest pimento cheese roll-out in fast food chains? Biscuitville has a new pimento cheese bacon biscuit. A documentary about Brother Joseph and his building of what’s known as Ave Maria Grotto in Cullman is being made now, and will be released this fall. In the lawsuit, Lee alleges that when her long-time literary agent, Eugene Winick, became ill in 2002, his son-in-law, Mr Pinkus, switched several of Mr Winick’s clients to his own company. Mr Pinkus is alleged to have transferred the rights to secure himself “irrevocable” interest in the income derived from Lee’s book. He also sought to avoid paying legal obligations he owed to his father-in-law’s company for royalties, according to the lawsuit. It is further alleged that Mr Pinkus failed to respond to offers on e-book rights and a request for assistance related to the book’s 50th anniversary. The lawsuit bids the court to assign any rights in the book owned by Mr Pinkus to Lee and asks that she be returned any commission he took from 2007 onwards. The Great Smoky Mountains National Park has scheduled June 6-13 as the Elkmont Firefly Viewing Event. A firefly species known as Photinus carolinus flashes synchronously to attract mates. Thousands of visitors throng the park each year to see the naturally occurring show. Little Rock Soiree lists the ten dishes to eat in central Arkansas before you join the ancestors, and one of them = the tamales at the LR Doe’s. One of the best-known barbecue places in the state, Snow’s BBQ in Lexington, is open only on Saturdays, and opens its doors at 8 a.m. Who eats barbecue at 8 a.m.? I do. Hell yes, many times. It’s only three hours from Dallas. It’s not that far to go for great barbecue. You leave at 6 a.m. and a leisurely drive gets you there at 9. The beauty of a place which is open at 8 a.m. is that is that it lets you eat barbecue all day long. Nashville Scene fairly gushes over Jim ‘n Nick’s. You’d be hard-pressed to find a can opener in a JNN kitchen, and they have even gone as far as to invest in pig farms and processing plants to control their supply chain and encourage the use of heritage breeds of pig. The result is food that tastes like a combination between a great barbecue joint and a meat-and-three restaurant. At last year’s Big Apple BBQ Block Party in New York City, I watched Yankees line up around the block for some South in their mouth as many of them reveled in the first pimiento cheese they had ever tasted served with spicy link sausage and some saltine crackers. Sure, it was utterly simple, but it was also reverential and revelatory. The 90-year-old Lauren Rogers Museum of Art in Laurel is showing off their $3MM in renovations, including a Chihuly chandelier. …Despite admirable efforts to connect battlefields to the larger history of the Civil War, the one thing that battlefields can teach very well is the history of what happened in a particular place. If the goal is simply to inspire thoughts about the larger social history of the Civil War, one battlefield is pretty much the same as the next — and it becomes difficult to explain why we need to preserve so many of them, and with so much land taken off the tax rolls. If the goal is to make people passionate about battlefields and their preservation, visitors need to engage with the actual place to understand its strategic importance and the tactical back-and-forth. The Arkansas D-G has reported that the Crystal Bridges Museum in Bentonville will be putting the works they bought a 50% stake in, the Alfred Stieglitz Collection, from Fisk University on display from November 9 through February 14. This is the deal that went to court because Stieglitz’s widow, Georgia O’Keeffe put a stipulation on the collection that her gift to Fisk never be sold. For other gifts of art with stipulations gone awry, see the Barnes Foundation. The Delta Blues Museum is one of ten recipients of the 2013 National Medal for Museum and Library Service. Work to complete the Gehry-designed pods at the Ohr-O’Keefe Museum of Art in Biloxi will begin now, and is scheduled to be complete spring 2014. Congress passed a bill bestowing the Congressional Gold Medal to Addie Mae Collins, Denise McNair, Cynthia Wesley, and Carole Robertson. Full text here. 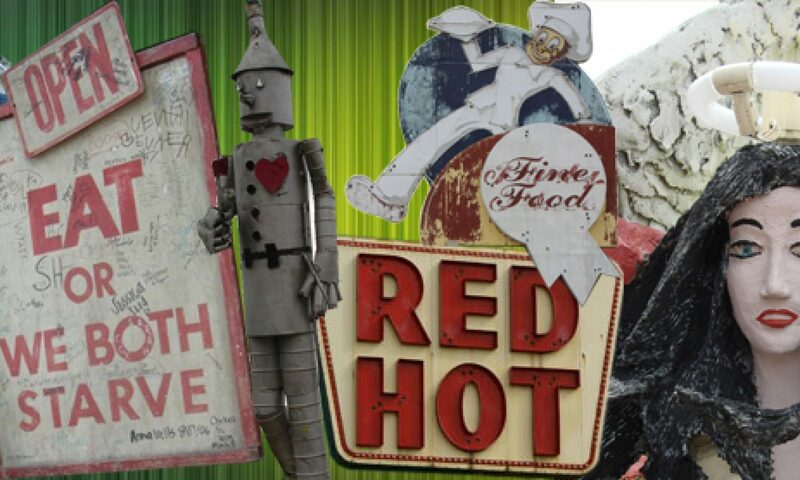 The House of Blues has a pretty amazing collection of folk art, and around 200 of their pieces will are now on display at the Ogden in an exhibit titled “When You’re Lost, Everything’s A Sign: Self-Taught Art from The House of Blues” through July 21.